The Buldak chicken bowl was sold out, so I ordered the Bulgogi beef bowl instead. Really good! I recommend using the sweet/sour sauce (red in color). 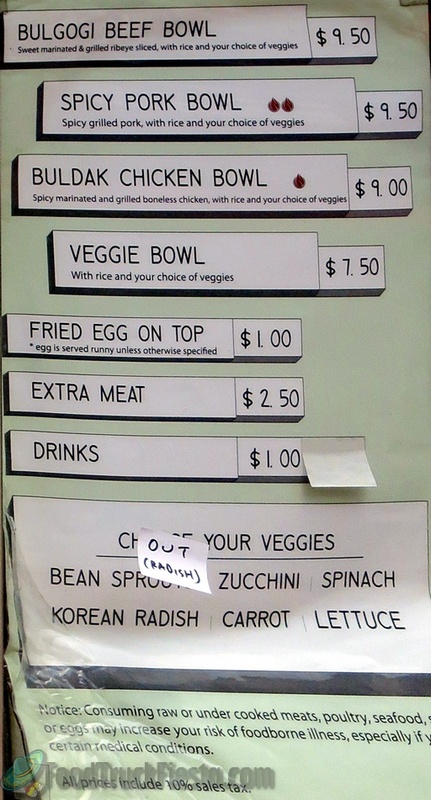 Aug 05, 2014 by Danielle H.
The Buldak chicken bowl was sold out, so I ordered the Bulgogi beef bowl instead. Really good! I recommend using the sweet/sour sauce (red in color). Got all the vegetables. Will try the chicken next time! I really like this Korean rice bowl truck. All the ingredients are similar to the way I would make at home, yes I'm Korean. Of course I got the fried egg on top. If you ask them they will make the egg any way you want them. I asked for over medium and that is exactly what I got. And of course the red chili paste, must use lots of that stuff!! Portion size is really good. Nice people too. F&R is one of my favorite trucks and has been for some time. Unless it's just been bad luck, my last two visits have been underwhelming due to the extremely small amount of rice in the bowl. I'm hoping it is just bad luck, but my fear is that F&R have cut down the portion so they don't run out as fast. If that's the case, they should offer an option of purchasing extra rice. Looking to try something different, gave Fire & Rice a try. If 1/2 stars were allowed I'd have given it 3.5...but I can't see 4 so 3 it is. On the up side, though there is a line is moves FAST, so don't let that discourage you. Customer service wise, friendly, happy to answer questions, etc. The portions are reasonable (though not generous). Taste wise the pork was good...but not by any means spicy. All in all good, but no "wow!" factor. This is one of the best bimbibap trucks around (the Kimchi BBQ truck also offers tasty bowls). The spicy pork bowl has quite a kick; the chicken and beef are milder on the heat scale. This truck offers the traditional bean sprouts in addition to carrots, zucchini, spinach, lettuce and radishes so their veggie offerings are different than most. The eggs (optional) are cooked perfectly and the end result is very flavorful, especially if you add the ginger dressing and spicy sauce that is available. Last week they were out of many of the fixings so when I mentioned this today they were very accomodating and put some extra lettuce etc. in my bowl which was fantastic (and much appreciated! Will definitely be going back. Very friendly service I take a late lunch break so they were out of the spicy pork, but I loved the half and half bowl I had today, so I will definitely go back! I come back and back again, so figured it was finally time to post a review. While this time I went with the beef, I go back and forth with the pork.. I come back and back again, so figured it was finally time to post a review. While this time I went with the beef, I go back and forth with the pork... both are full of flavor (and the pork full of spice, but I douse the beef in the spicy red sauce too)and never disappointing. and don't forget lots of the ginger sauce. This truck is not to be missed! Flavorful and plentiful! Outstanding especially with the spicy sauce. I plan many repeat visits!Stay Cool. Flavorful and plentiful! Outstanding especially with the spicy sauce. I plan many repeat visits! OMG!! My mom is the best Korean cook I know. Fire & Rice taste just like hers. It was soooo delicious, tasty, and full of flavor. They had the ginger dressing and spicy sauce outside so I could add as much I like. I am telling everybody I know. Great job. I am so happy I found it. My favorite food truck!! I have walked far out of my way to get a stomach full of Bulgogi before. They offer a great assortment of veggies, and I love a healthy portion of the non-spicy sauce with a splash of the spicy red sauce before mixing it all up. This is a colorful and fragrant meal that I can't get enough of. Meats are tender and well-marinated, and if you're in for a protein binge, the egg and extra meat can induce a blissful food-coma! Going out again today to try the chicken option. 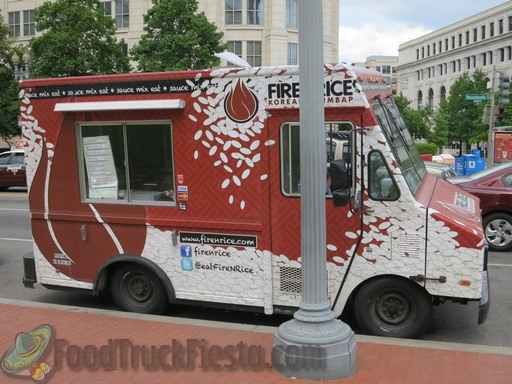 Fire & Rice launched in June, 2012 serving Korean cuisine in the District. Menu items include various bowls of beef, chicken, pork and veggies.